This is a history of windows based on curiosity, imagination, and some facts. Have you ever been curious about what happened in ancient times or the times when dinosaurs and cave man roamed the earth? You would have to think that windows did exist during those times. 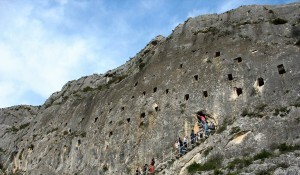 For example the Moorish caves of Bocairent in Costa Blanca, Spain pictured above shows holes on the sides of the caves that are like windows. Very similar to windows on a ship or how about this, windows that are used for natural light like the windows we have in our homes this present day. Imagine the days when there were caves; when cavemen and women roamed the earth. Did the windows function as they were used today? Amazing what windows can tell us, especially living in an older house. Back then we would imagine that windows were just pure holes and that it provided ways to live and survive. Very similar to this present day if you check out the previous blog, “Why windows are important” it is clear that human life cannot survive without windows. Windows is what gives a house life and with that it creates an aura of spirit and mind. In Wikipedia “Window History”, it states that, the earliest windows were just holes in a wall. Later, windows were covered with animal hide, cloth, or wood. Shutters that could be opened and closed came next. Over time, windows were built that both protected the inhabitants from the elements and transmitted light, using multiple small pieces of translucent material (such as flattened pieces of translucent animal horn, thin slices of marble, or pieces of glass) set in frameworks of wood, iron or lead.” As centuries provide us with progression, in this day of age it is not any different. The next waves of windows will probably be the next topic, “The future of windows”. Accurate Siding & Windows, Inc., performs the following services using the finest products in the industry: Replacement Windows, Vinyl Siding, Decorative Vinyl Siding, Vinyl Replacement Windows, Double Hung Windows, Casement Windows, Insulated Windows, Alcoa Siding, ThermaTru Doors, Nailite, CertainTeed, Crane Siding, Simonton Windows, Dove Vinyl Windows, Andersen Windows & Doors, Fiberglass Entry Doors, Contractor Services, Siding Contractor, Vinyl Siding Virginia Beach, Vinyl Windows Virginia Beach, Home Improvement, Home Improvement Virginia Beach, Window Products, Replacement Windows, Entry Doors, Window Replacement Contractor, Window Replacement Company, Home Improvement Virginia Beach.. Window installation service by professional window contractors. Window installation companies for window glass replacement service, window Install, window repair, window replacement, glass repair and home window repair Virginia Beach. Accurate Siding & Windows, Inc., performs the following services using the finest products in the industry: Replacement Windows, Vinyl Siding, Decorative Vinyl Siding, Vinyl Replacement Windows, Double Hung Windows, Casement Windows, Insulated Windows, Alcoa Siding, ThermaTru Doors, Nailite, CertainTeed, Crane Siding, Simonton Windows, Dove Vinyl Windows, Andersen Windows & Doors, Fiberglass Entry Doors, Contractor Services, Siding Contractor, Vinyl Siding Virginia Beach, Vinyl Windows Virginia Beach, Home Improvement, Home Improvement Virginia Beach, Window Products, Replacement Windows, Entry Doors, Window Replacement Contractor, Window Replacement Company, Home Improvement Virginia Beach, Virginia Beach 2009 Tax Credit, 2009 Tax Credit, 2009 Stimulus, Home Improvement Tax Credit, 2009 Home Improvement Tax Credit, Chesapeake 2009 Tax Credit, Hampton Roads 2009 Home Improvement Tax Credit. window contractors for window installation service. Window installation companies for window Install, glass repair, window repair, window replacement and window glass replacement service.